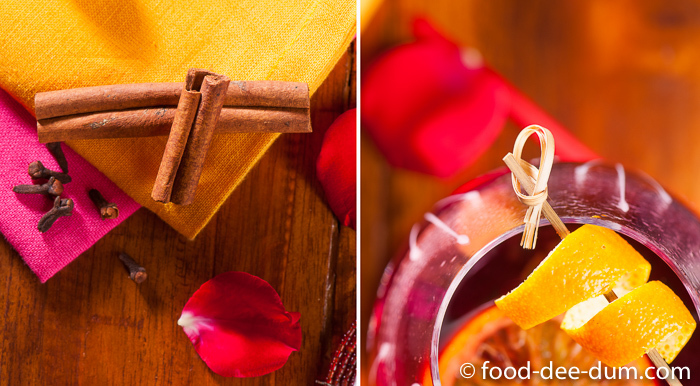 Warm, Spiced Mulled Wine. Perfect for a festive winter night, or a special occasion for two. 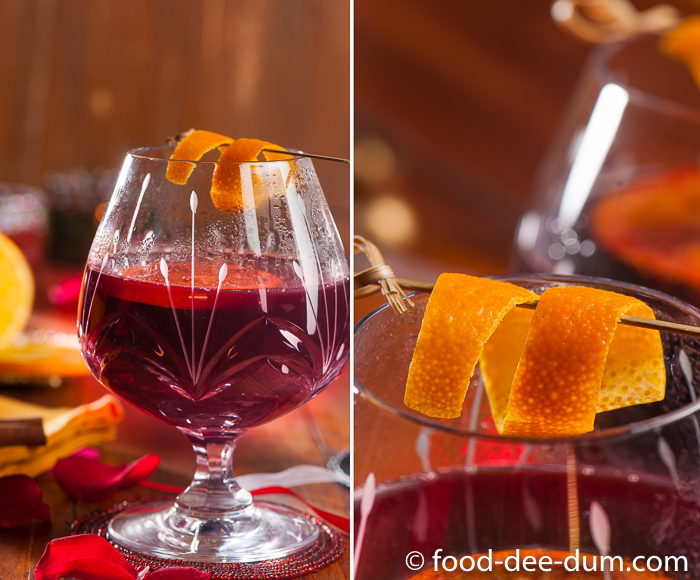 I think that the first time I had mulled wine was when I was 16, at a Christmas dinner at my parents’ friend’s home. One of those rare moments of indulgence when your parents let you bend the rules, just a little. Never to be spoken about again. Until next Christmas or birthday! But about the mulled wine, it was one of the most delicious things that I have tasted. 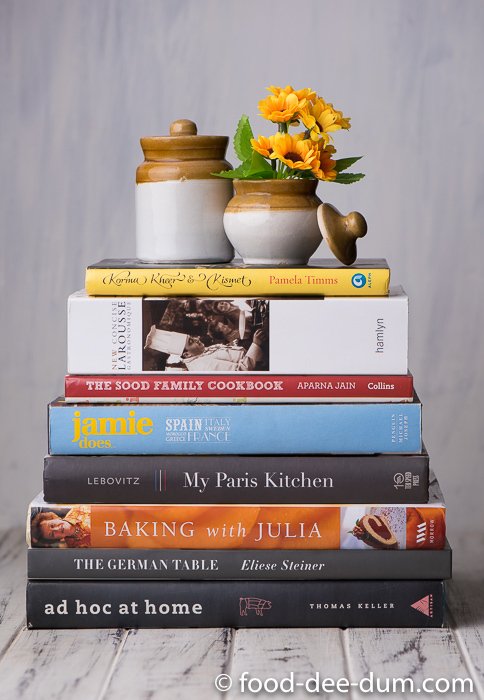 It brought together some of my favourite flavours – citrus, ginger and warm spices. I was ecstatic that entire evening, and only some of it had to do with the actual consumption of alcohol. 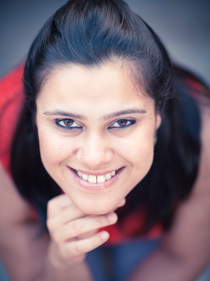 When I was finally (legally) allowed to drink, I tried ordering it at a few restaurants here in Delhi but I was mostly disappointed. There was hardly any flavour, just warm wine with a decorative spice thrown in for garnish. So I gave it a go at home and was pleasantly surprised at how easy it is. I just couldn’t get why something so simple and delicious for so evasive for restaurants. 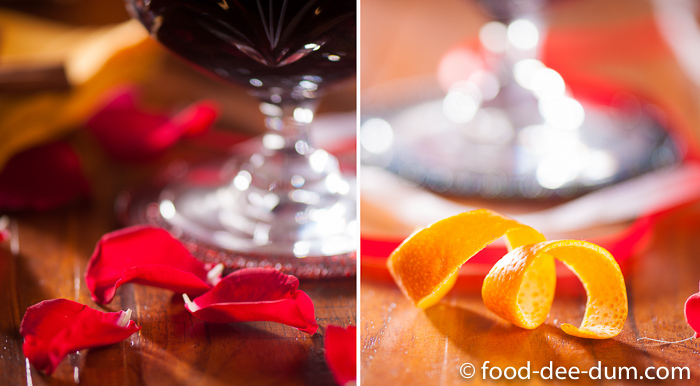 My love for mulled wine stepped up a few notches when I visited continental Europe for the first time in 2012. My brother’s graduation was slated for December, just around the Christmas Holidays. We figured it was the perfect time to travel and explore a little. Every city or town we visit was mostly slowing down for the holidays and there were beautiful decorations all over the city. Christmas markets abounded in every city and the most popular stalls were always the ones selling Vin Chaud or Gluhwein (hot wine). Almost as popular were hot chocolate stalls but I guess alcoholic beverages win, hands-down! I may be exaggerating but, at that time, I felt like I was never ever without a glass of mulled wine. If we were outdoor, I would have a full glass in my hand. It was so warm and comforting in the cold, the kind of cold I have never experienced before. There were wine stalls everywhere, selling it by the glass. Almost never in paper cups but in actual mugs or glasses branded with that venue’s name. You have to put down a small safety deposit for the glass and just keep refilling. For as long as the stalls don’t run out! You can return the glass in exchange for your safety deposit or just keep as a souvenir. I officially collected 13 souvenir cups during that trip. Yes, I’m crazy that way. I actually like it even better when the weather isn’t freeze-your-pants-off-cold. Because when it’s that cold, I just drink too much of it. Just to keep warm. Before I know it, I’m just done for the night. Now is the perfect time for me. It’s cold, there’s a pleasant nip in the air. There’s just absolutely no excuse to not sip warm alcoholic beverages to spice up the evening. What’s even better is that, apart from being easy, it’s one of those recipes that need not be a recipe at all. 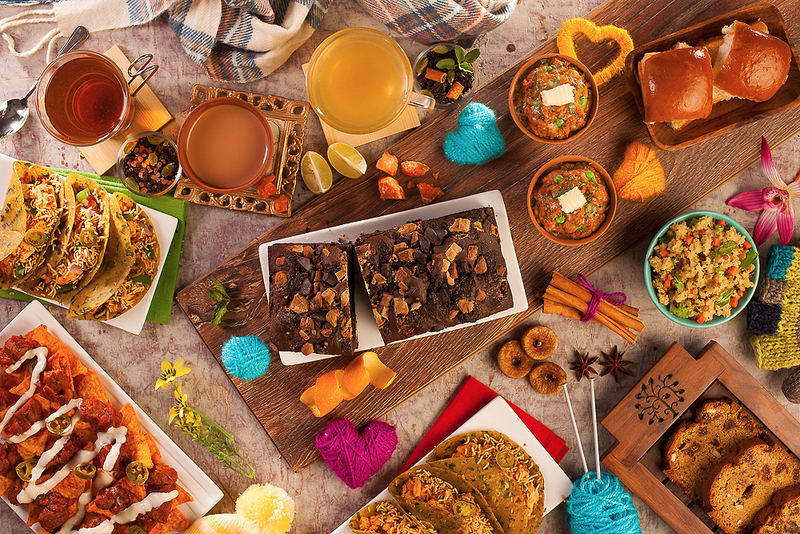 All you need is wine + sugar + spices. Once you have the basics, you can do what you like with the ingredients – add/subtract/multiply. Go crazy experimenting and find the one you like. About the wine to be used, apparently the older and more traditional recipes used port or claret. I just prefer to use any inexpensive wine because, frankly, you can’t taste the wine in it’s original form once it’s been mulled. So go for any reasonably priced Cabernet or Merlot. There are 2 main parts to the process I used. The first was to make a flavoured syrup using the juice, spices and sugar so that we can use this as a base. Then adding the alcohol so it can gently simmer away and absorb all the flavours. The reason we do this is because we don’t want to bring the wine and liqueurs to a rolling boil at any time. Using a sharp paring knife, I peeled the skin of the oranges leaving behind the bitter white pith. 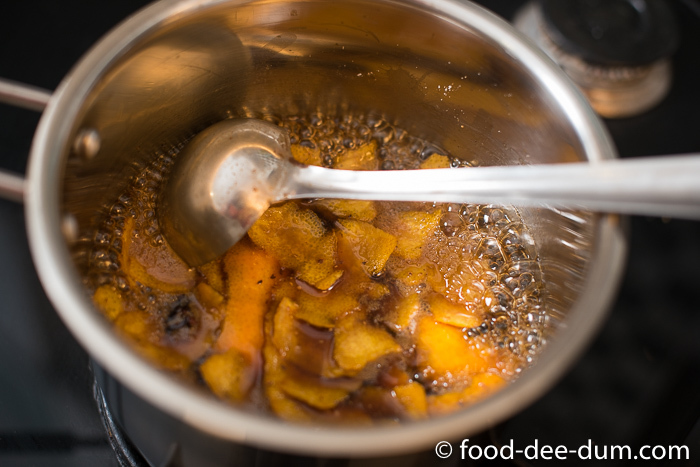 In a medium sized stainless steel saucepan, I placed the sugars and added in the peel. I like to break the peel into bits and squeeze out the oils onto the sugar before tossing the peel in. Then I smushed it all up with the back of a ladle so the sugar could absorb as much of the essence and oils as possible. Grated the nutmeg and added the spices to the sugar as well. I squeezed the juice from the oranges – I got about 1/2 cup. Adding the juice and 1/2 cup of water to the sugar-n-spice mix, I placed it on high heat. Stirring occasionally, I waited for the sugar to dissolve. One it did, I lowered the heat to medium and cooked it for 3-4 minutes until it felt a little syrupy. But this isn’t confectionary so there’s no need to be technical about the stages of sugar! Turning the flame off, I added the liqueurs and the wine to the saucepan and gave everything a good mix. I turned the stove on again at the lowest setting and let the wine simmer away for 30 minutes, giving it an occasional stir. Taking it off the heat, I served it up as soon as it had cooled to a comfortable temperature. I left behind the cooked peel and spices in the pot and used fresh orange to garnish each glass with – a slice and some peel for each serving. If you are making larger batches, then you can use a pot with a tight fitting lid. Leave the wine to simmer in the pot with the lid closed and serve as and when required. Experiment with this to find your perfect mix. Switch up the sugars or use honey/maple/agave. Try adding ginger (I love this but the husband doesn’t so we compromise), vanilla pods, cardamom, star anise. Not necessarily altogether but they are a few more things to play with! The only constant is wine + sweetener + flavour. So make your own version and share it with me in the comments below. 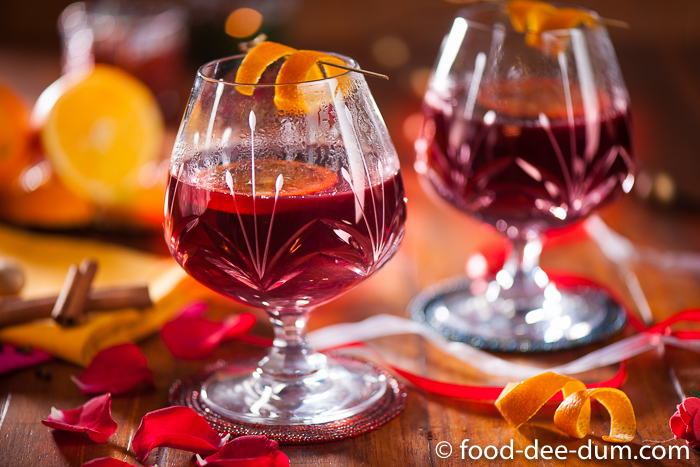 A delicious warm, spiced wine. Perfect for warming up on chilly evenings. Using a sharp paring knife, peel the skin from 2 of the oranges. Avoid the bitter white pith. You can even use a zester if you like. 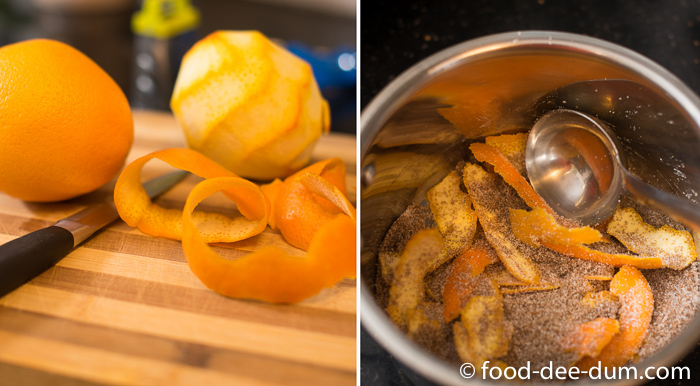 Set the peel aside and juice these oranges, you should get approximately ½ cup juice. In a medium saucepan, place the sugars, the peel, the spices and mix together. Smush everything together using your fingertips or the back of a ladle to extract as much oil and essence from the peels and infuse into the sugar. 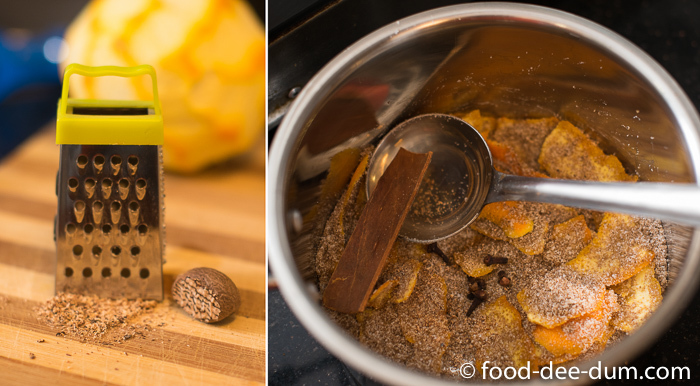 Add the orange juice and ½ cup water to the sugar-n-spice mix. Place this saucepan on high heat and cook, stirring, until the sugar dissolves. 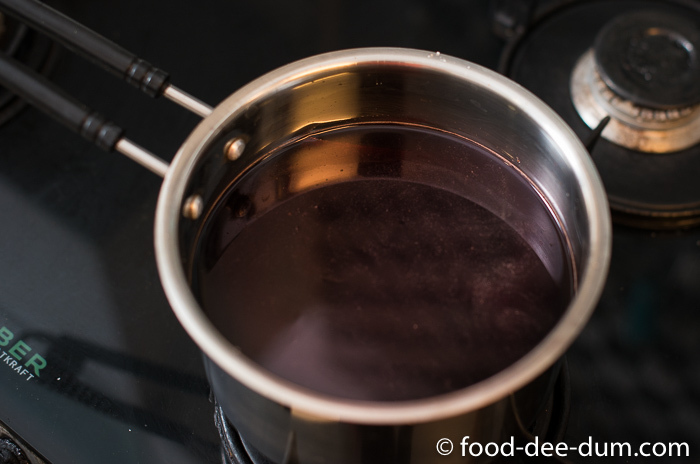 Reduce the heat to medium and cook until the liquid becomes syrupy, about 3-4 minutes. Turn of the flame. Add the brandy, Drambuie and wine to the saucepan and stir to combine. Return the saucepan to heat at the lowest setting and simmer for 30 minutes. 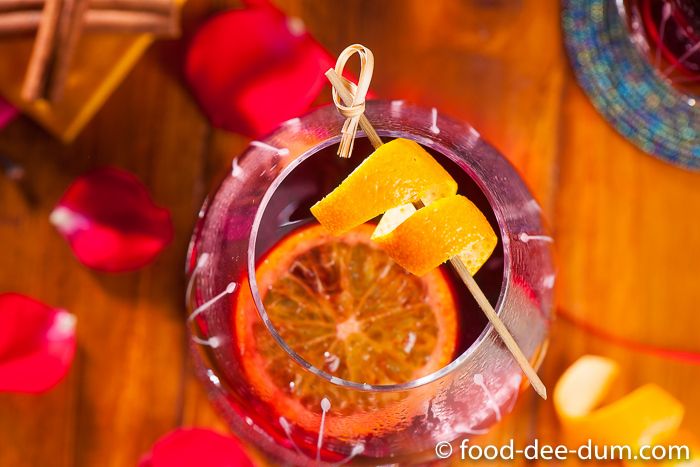 Remove from heat, strain and serve, garnished with a slice of fresh orange and some peel.